18.1 SZ tells us that he is familiar with the doings of AL even tough he is not always present.If you check the subsequent actions in their lives, I get the impression that SZ , the humanist Bourgeois is following his “intellectual hero” like a dwhining discarded puppy. I am looking back at the subtitle : The life of the German composer Adrian Leverkûhn as told by a friend. A friend ? Wishful thinking ? Al is feeling more confortable in the presence of others. Not only Kretzschmar, but also others. Take for instance Rûdiger Schildknapp, AL’s companion for his Italian travel. At the end of chapter 10 SZ, confesses that “Schildknapp is a far better partner for such moods ( of demonic laughter ) – which is why I have always been a little jealous of the man”. 18.3 Neat definition of Music : that strangely cabalistic, simultaneously playful and rigorous, ingenious and profound craft. 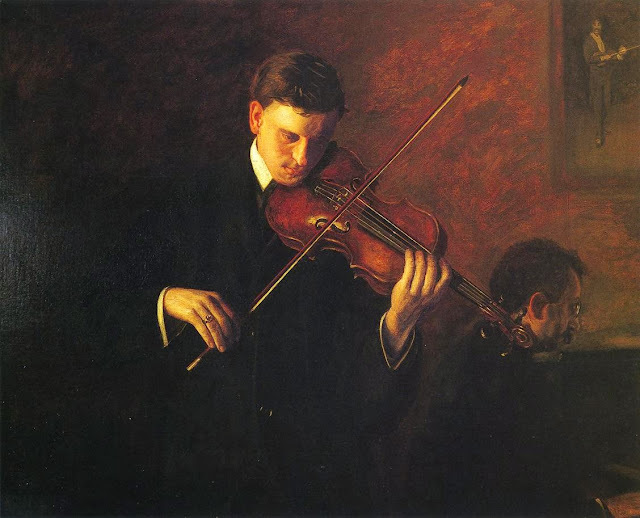 “Teacher and pupil were essntially quite far apart in matters of musical instinct and intent – indeed, any aspirant in the arts finds himself almost by necessity dependent on the guidance of a master of his craft from whom he is already half estranged by a generation’s difference. Things only go well if the master nevertheless surmises and understands these hidden tendencies – sees them ironically , if need be – but is careful not to stand in the way of development”. And so Kretzschmar lived in the self – evident, unuttered conviction that music had found its ultimate, highest manifestation and efficacy in orchestral works – Something Adrian no longer believed.